I see that GU has a big game next Saturday against #22 Memphis. Any chance they'll overlook lil' old UP on Wednesday? up7587 wrote: Any chance they'll overlook lil' old UP on Wednesday? The early line has GU winning by 16! There will be a watch party at the Lloyd Center Buffalo Wild Wings. They are really trying to get that to become a tradition, so please consider going if you can make it! Stonehouse wrote: There will be a watch party at the Lloyd Center Buffalo Wild Wings. They are really trying to get that to become a tradition, so please consider going if you can make it! These Wednesday games are tough. At least this time, the watch party at Interstate Lanes will be have a TV to use instead of Wtv on a cell phone. can't say I blame them. in all honesty, I think the regular season champ deserves the auto-bid to the big dance. NoPoNeighbor wrote: can't say I blame them. in all honesty, I think the regular season champ deserves the auto-bid to the big dance. Well, it would save a trip to Vegas! It is easy to see the advantages of having a conference tournament, and of that tournament having an important prize on the line for the winner... but why play 18 conference games if everyone goes to the conference tournament with a chance to win the auto-bid? This is especially egregious in smaller conferences, where the regular season winner won't get an at-large berth if it doesn't win the tournament. Isn't it in the conference's own interest to have its best team participate in the NCAA tournament? If we're going to have a tournament, it makes sense to me to give the top couple of teams a huge leg-up, as the WCC has done until this year. Only if they will have the sound on for the game. Otherwise it is a completely sub-par viewing experience. NoPoNeighbor wrote: It is easy to see the advantages of having a conference tournament, and of that tournament having an important prize on the line for the winner... but why play 18 conference games if everyone goes to the conference tournament with a chance to win the auto-bid? This is especially egregious in smaller conferences, where the regular season winner won't get an at-large berth if it doesn't win the tournament. Isn't it in the conference's own interest to have its best team participate in the NCAA tournament? Well, the theory is the regular season champ is going to the tournament anyway, so it's a way to get another team in. But playing a tournament just brings down the winners rpi. That's why the WCC tourney went to the goofy format from the fully seeded bracket it originally used ( Few pushed hard for it) the top teams got "better" opponents without having to play the worst teams. With the new format, the top teams still don't have to play the worst teams, so it is a compromise. They still get a leg up. I don't disagree with what is being said... but money has a lot to do with it. It's a good chance for a conference to make money; more TV games, ticket sales, etc... Not to mention that fans seem to like them, as they do show up and buy said tickets. In the case of the WCC, it is also when meetings are held, the Hall of Honor breakfast, etc. In a perfect world, I would like something like the top 4 teams make the conference tourney, hosted by the #1 seed. The problem with that is that the host may not be known until a few days before the tourney, causing huge last minute travel limits for the other teams (see the Big Sky tourney). • Portland concludes its three-game West Coast Conference road trip on Wednesday against the Gonzaga Bulldogs. Tip-off is scheduled for 8 p.m. at the McCarthey Athletic Center. • The game will be televised live on ROOT Sports NW with Greg Heister, Richard Fox and Dan Dickau calling the action. • 1080 The Fan (KFXX) will broadcast the Gonzaga (Feb. 5) and BYU (Feb. 22) road games. Coverage begins 30 minutes prior to tip-off with the pregame show. • Sports 910 AM (KMTT) is the primary home of Portland Basketball. Veteran voice of the Pilots Bill Johnson provides the play-by-play. • Pilot fans are encouraged to gather at Buffalo Wild Wings Lloyd District for Portland watch parties of all WCC road games this season. • Located at 1200 NE Broadway Street, Suite 20 Portland, OR 97232, Buffalo Wild Wings will provide televisions and space for Pilot fans to gather for all road games. For more information about the watch parties contact Jon Brooks at (503) 943-7431 or brooksj@up.edu. • The Pilots (13-10, 5-6 WCC) sit in sixth place in the WCC standings after a road split last week in the Bay Area. Portland lost to San Francisco (84-71) on Wednesday before defeating Santa Clara (76-64) on Saturday. • Junior C Thomas van der Mars scored a career-high 28 points and grabbed 11 rebounds in the win over SCU, while junior G Kevin Bailey scored his 1,000th career point in the second half of the game. • Portland’s first five WCC games were at home and the team will play just two more home games. The second half of UP’s schedule features 7-of-9 games on the road. • Bailey, who leads the Pilots and ranks seventh in the WCC in scoring (16.6), became Portland’s 36th 1,000-point scorer. He has reached double figures in all but two games this year and scored 20-plus eight times. • Senior F Ryan Nicholas joined Portland’s 1,000-point club in the second half against Princeton on Dec. 21. He is the WCC leader in rebounding (9.0) and is third on the team in scoring (12.4). He also ranks sixth on Portland’s career rebounding list. • Van der Mars has had a breakout year averaging 12.8 points and 7.0 rebounds per game. His 19-point, 18-rebound effort vs. Portland State earned him league player of the week honors on Dec. 9. • Portland returns all five starters and nine lettermen from last year’s team that finished 11-21 overall. • Head coach Eric Reveno returns for his eighth year on The Bluff and recorded his 100th career win on Nov. 27 vs. San Jose State. • Assistant coaches Eric Jackson and Mike Wolf also return for their eighth year, while Colin Pfaff returns for his second year as an assistant coach. • Portland looks to return to its 2008-11 success, a stretch that included back-to-back 20-win seasons for the first time in school history and 60 wins over three seasons. • The Pilots were invited to the CollegeInsider.com Postseason Tournament (CIT) for three consecutive seasons from 2008-2011. • The Pilots were picked to finish ninth in the 10-team West Coast Conference in the pre-season coaches poll. • Coach Reveno posts a 100 percent graduation rate and the men’s basketball program has one of the top APR scores in the nation (995), receiving a Public Recognition Award from the NCAA last spring. • The Bulldogs (20-3, 10-1) are ranked No. 20 in the Coaches Poll and No. 23 in the AP Poll this week after sweeping Santa Clara (54-52) and San Francisco (75-65) last week. • Gonzaga needed a last second three-pointer from senior F Sam Dower to pull out the win over the Broncos. • Junior PG Kevin Pangos leads the team in scoring at 15.4 points per game, while Dower adds 14.8 per game. • Junior G Gary Bell, who missed the first game against UP with a broken hand, has returned to the lineup. • Mark Few is in his 15th year as head coach of Gonzaga and has led the Bulldogs to the NCAA Tournament every season. His overall record is 394-96. • The Pilots snapped a 20-game losing streak to GU with an 82-73 wire-to-wire win at the Chiles Center on Jan. 9... it was also the first home win for the Pilots in the series dating back to 1996... Bryce Pressley led the Pilots with 15 points and nine assists. To me the conference tournament is part of the allure of college basketball. But for strictly in terms of the WCC, it affords two roads to qualify for the NCAA tournament. You can put together non-conference and conference wins that will get you into the dance regardless of tournament performance via an at-large bid, or you can win the tournament outright regardless of what happened the rest of the year. And the last one is the key for me and why college hoops is so captivating. After you get to a certain point in the season, you play until you lose. Simple as that. You keep winning, you keep playing. Even a terrible team has a tiny glimmer of hope until the bitter end. If they're truly concerned about "RPI drag" I think Gonzaga needs to go compare who they'd get in the first round against who teams like Cincinnati or San Diego State will get in their conference tourneys. I think they'd be surprised at how well teams like Pacific/LMU stack up against Temple/USF in the American and Fresno State/Air Force in the Mountain West...conferences which, by the way, have the same tourney format as the WCC. DeanMurdoch wrote: ...for those guys, it doesn't matter if the MEAC sends NC Central or Coppin State - they're getting hammered in the first round anyway. But it certainly matters to the players, fans and university communities at NC Central and Coppin State! The only thing worse than getting hammered in the first round of the NCAA tournament is not having the opportunity to get hammered in the first round of the NCAA tournament. They've been waiting a long time to use that headline! Pilots are 10-0 when score 74 or more points, 3-5 when score 69-73 points and 0-5 when score less than 69 points. Gonzaga averages 79 points a game. Now with that - 2 things that will play a role in tonight's game will be limiting Gonzaga's offensive rebounding and minimizing the turnovers. We need to keep their offensive rebounds around 6-8 and keep our turnovers at 10. 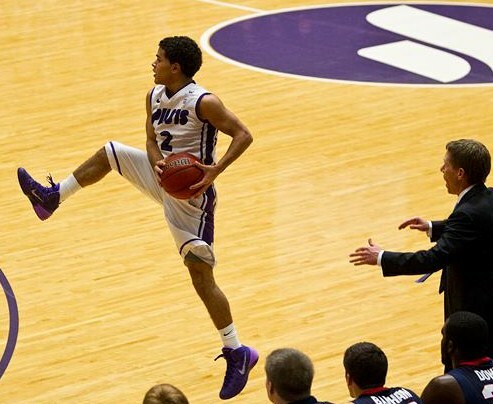 The Pilots (13-10, 5-6) handed the Bulldogs (20-3, 10-1) their only WCC loss. The rematch is Wednesday night and Portland has Gonzaga’s undivided attention. Comments from Gonzaga players and coaches suggest otherwise. The Pilots had five players in double figures, led by as many as 17 and made 52 percent of their shots – the only GU opponent to shoot above 49 percent this season. 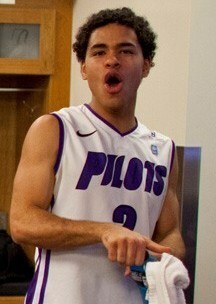 Portland senior forward Ryan Nicholas is entering the stretch run of his collegiate career. Just don’t expect him to alter his stride. The Gonzaga Prep product has been remarkably consistent. After spending his freshman year backing up Kramer Knutson and Luke Sikma, Nicholas averaged 11.5 points and 7.6 rebounds as a sophomore. Last year he checked in at 13 points and 8.7 boards. This season he’s at 12.4 points and 9.0 rebounds. Nicholas was the team’s leading scorer the last two years, but ranks third on an improved Pilots squad pursuing a top-five finish in the WCC. 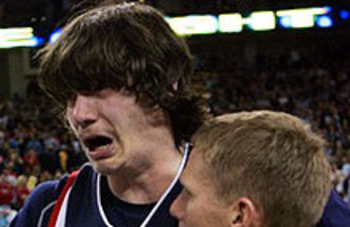 Portland broke a 20-game losing streak to Gonzaga with an 82-73 win last month. Please post the link to the article if you find it important enough to cut/paste. The guys who do the writing are in a dying industry that relies on web traffic and clicks generated, so any clicks you can send their way are greatly appreciated. oh and here's the link to my latest column. adoptedzag wrote: Please post the link to the article if you find it important enough to cut/paste. The guys who do the writing are in a dying industry that relies on web traffic and clicks generated, so any clicks you can send their way are greatly appreciated. I think some of us are under the impression we are doing our constituents at PN a service by editing and posting articles, while attributing the author, so the PN readers won't have to leave the PN website. I completely agree! Thanks for the reminder, adoptedzag. No problem pasting in text from an outside source, but it's much appreciated to also provide the URL.